A total of 66 properties in Battle are without electricity supplies after a car collided with a telegraph pole on a main road on the approach to Hastings, UK Power Networks said. A car collided with the telegraph pole on the A2100 at 12.25pm today (Monday, September 3), according to police. A spokesman for UK Power Networks said: “Our engineers are working as quickly as possible to restore electricity supplies to 66 properties in Battle after a cable was damaged on an electricity pole earlier today. 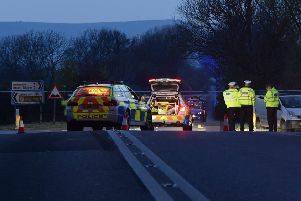 The A2100 was closed from Powdermill Lane, Battle, to Beauport roundabout, in Hastings, shortly after the collision.